Europe's service industries grew at the weakest pace in more than four years in January, as the possibility of a recession in the U.S. weighs on the European expansion. Royal Bank of Scotland Group Plc's services index dropped to 50.6, the lowest since July 2003, from 53.1 in December. A reading above 50 indicates growth. The slowdown presents a real headache for the view of European Central Bank that the euro region is strong enough to cope with a cooling U.S. economy and that inflation concerns prevents them from following the Federal Reserve into monetary easing. In the U.S., which is the second biggest destination for euro-area exports, the Fed eased monetary policy by the most since 1990 last month, to bolster the economy. The euro fell as much as 1.1 percent to $1.4671 and traded at $1.4683 at 11:32 in Frankfurt. The Dow Jones 600 Stoxx index extended declines after today's figures, falling as low as 326.33 from 329.13 yesterday. The national indexes fell across the board with Germany's service industry slumping below the 50 threshold for the first time in 4 1/2 years and Spain's service sector shrinking the most since the survey began in 1999. A composite measure for the euro region fell to 51.8 from 52.7 the previous month, according to the report, which is based on a survey of purchasing managers by NTC Economics. 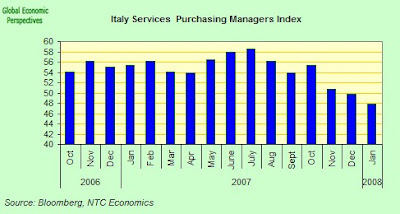 The Italian services index fell to a seasonally adjusted 47.9 in January from 49.7 in December, reaching the lowest level since May 2005. The International Monetary Fund last week cut its euro-region growth estimate by half a point to 1.6 percent, saying the turmoil in financial markets has spread to the rest of the economy. 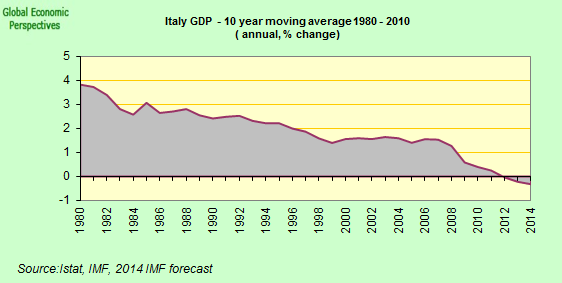 The IMF now expects the global economy to expand 4.1 percent this year, below the 4.4 percent pace projected in October.